For upholsterers in Sheffield get in contact with Eco Sofas. Based in Sheffield, we cover throughout Sheffield, as well as North Derbyshire, Barnsley, Rotherham and Doncaster. Our company has been established for many years and since our establishment we have developed an outstanding reputation. We have in excess of 40 years of relevant experience and we happy to provide you with friendly and expert advice. We have a wide range of fabrics to choose from and we are an ideal choice for all domestic customers. All of our work is guaranteed for your peace of mind and we can provide you with free estimates, day or evening in your own home. All of our members of staff are fully trained craftsmen and we don't take deposits. We recycle as much as we possibly can and we provide superb value for money as the rates that we charge are very competitive. 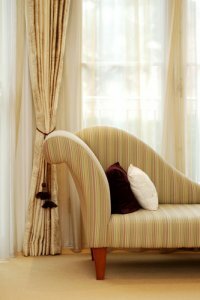 If you would like to find out more about our upholstery services then please feel free to get in contact with us today. Make Eco Sofas your first choice for all of your upholstery requirements from settees, chairs cushions to headboards and frame repairs. Get in contact with us for upholstery in Sheffield.